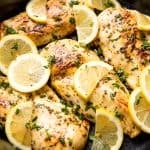 This Quick and Easy Lemon Chicken Recipe requires only a handful of pantry ingredients, but don’t let the simplicity fool you. It’s also outrageously delicious! This recipe is super easy to make. It’s one of those quick and easy weeknight meals that you’ll want to keep forever. Even picky eaters tend to like it! As written, this recipe calls for marinating directly in a gallon sized resealable bag. If you don’t want to use plastic, you can always marinate in a shallow dish. Simply whisk the marinade in a mixing bowl, place your chicken into a shallow dish or bowl, and pour the marinade right over. Can this recipe be used with chicken thighs? Yes it can! You can use skin-on, bone-in chicken thighs for this recipe, or boneless skinless chicken thighs. The cooking time will change slightly, depending on the size and thickness of your thighs. When using skin-on, be sure to render the skin by cooking it directly against the hot pan. This will help crisp it up. Cook with the skin side down first, and then flip to finish. Can I add vegetables to the skillet? This same seasoning works great on vegetables as well so you can create an entire dinner in just one skillet. Be sure to make a separate batch of the marinade for vegetables to avoid cross contamination. Vegetables that work well, diced red potatoes, zucchini, green beans, and asparagus. How long should I marinate the chicken? Do I have to marinate it? If you are in a hurry, you can absolutely skip the marinating time in this recipe. The chicken won’t have absorbed as much flavor, but it will still delicious. We recommend a minimum marinating time of 30 minutes for chicken and up to 8 hours. But when all else fails, it still works without marinating. Place chicken breasts in a gallon-size resealable plastic bag. 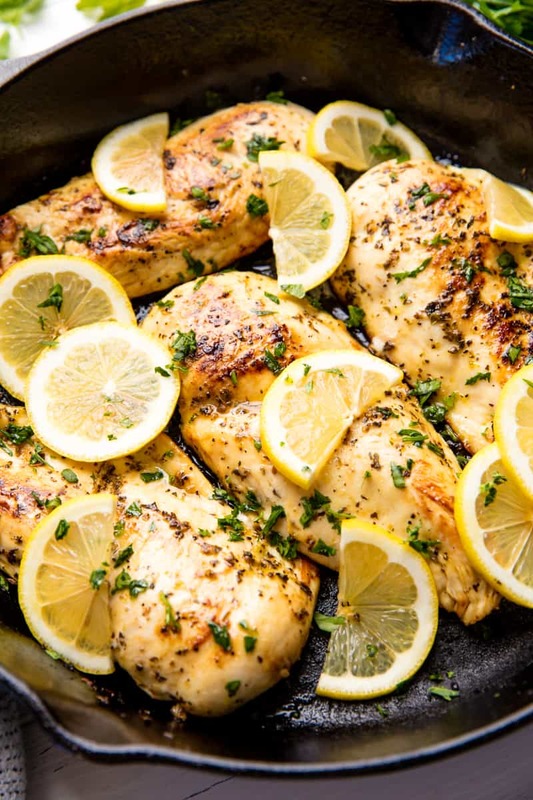 Pour in lemon juice, olive oil, lemon pepper, basil, oregano, and salt. Shake it a bit so all the chicken tenders get covered. Let marinate in the fridge for 30 minutes or up to 8 hours. Heat a heavy skillet over medium high heat. 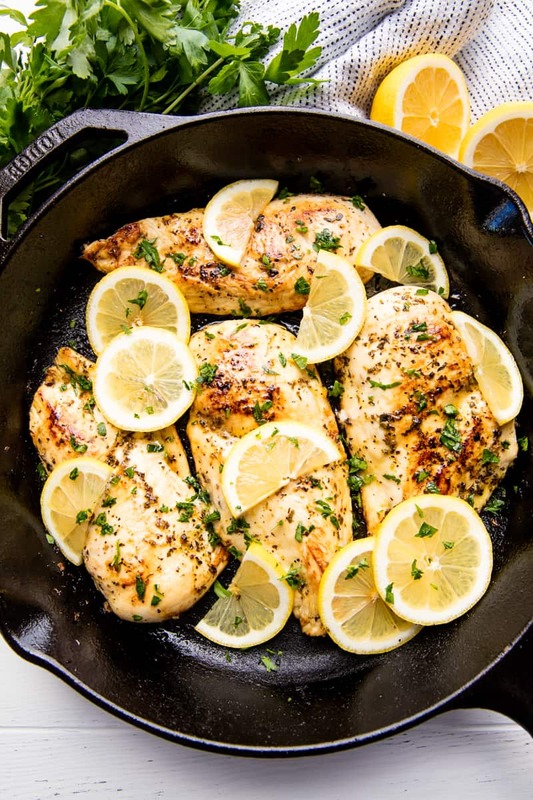 Remove the chicken from the marinade and place directly into the hot skillet. Discard any remaining marinade. Cook chicken 6 to 7 minutes per side, flipping halfway through. Continue cooking until the chicken reaches an internal temperature of 165 degrees Fahrenheit. Serve hot. Garnish with freshly chopped parsley and lemon slices (optional). Simply amazing, so yummy! Thank you for sharing this recipe, definitely a keeper! Fabulous! Added asparagus I had marinated after chicken was cooked and served with a side of risotto! A regular pan is fine. I couldn’t give this recipe five stars like I wanted, so I am hopeful it sticks this time. This recipe made outstanding tasting chicken in a short amount of time. I made it with “Garlic Bread” Roasted Potatoes and Roasted Cherry Tomatoes which had great complimentary flavors for a dinner menu. Everything was so delicious but the cherry tomatoes were such a surprise, I couldn’t stop eating them. Wrote this up as a meal to serve for company. Thank you so much! So delicious! I added a little flour toward the final browning stage and cooked in cast iron. WOW! My Daughter was asking for lemon chicken before she went back to college. The recipe was short and sweet…. Thank you. Fabulous and so easy!! Thank you! !